← Is Vitamin K2 the New Vitamin D? A few weeks ago, I ran out of my favorite moisturizer Dr. Hauschka’s Rose Day Cream. I wasn’t ready to spend another $43 or $54 or however much it is for more, so I decided to create my own face moisturizer that would provide some of the same benefits. I mixed up a combination of some of my favorite nourishing face oils and couldn’t be happier with the results, especially for the small amount of time and money I put into it. Over the years, I have made nearly every type of body product from lotions to bubble bath at home. Making a lotion or moisturizer is one of the most complicated usually, but my facial oil was both the easiest and the best yet. 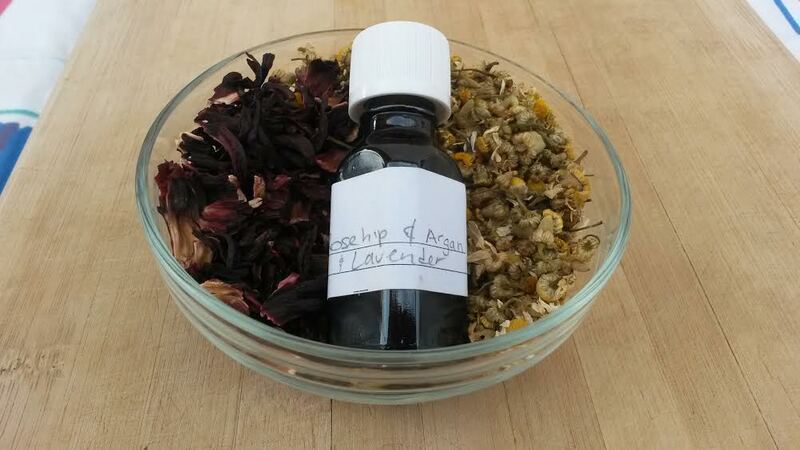 Combine ingredients in an essential oil bottle or other dropper bottle. Apply 3-6 drops to clean skin. I apply it after my toner while my skin is still slightly moist. I rub it on my palms and pressed the oil onto my face more than rubbing it in. If you still love something about your current moisturizer, try mixing a drop or two of this oil blend into it every day to give it an impressive boost. I chose these ingredients because they had the nourishing properties that I look for in a moisturizer for the face. Both the argan and rosehip oil are high antioxidants to protect the skin from environmental damage. Rosehip oil has been popular for years among people in the know. It can help rejuvenate skin and balance out uneven skin tone when used over time. It is high in vitamin C, which may help restore collagen for skin elasticity. Rosehip oil is also noted for its soothing and anti-inflammatory properties, which can be helpful for red and irritated skin. Argan oil is considered to be nearly a miracle when it comes to helping keep the skin looking younger. In addition to sharing many of the anti-inflammatory and rejuvenating qualities of rosehip oil, many people notice smoother skin in just a month of using it. Other people report it helps balance out sebum production thereby clearing up acne prone skin. It absorbs quickly so my skin doesn’t stay oily long after applying it. I chose lavender essential oil because I love putting it on my face. In the summertime, I like to mix a few drops into some aloe if I have been out in the sun. It makes my face tingle a tiny bit, but is gentle enough for sensitive skin. Lavender is considered to be an antimicrobial and anti-inflammatory essential oil that isn’t as harsh and drying as tea tree oil. Of course, this recipe can be very easily altered for your skin type. I have dry skin and am old enough to be thinking about preventing wrinkles. For acne prone or scarred skin, consider added tamanu oil instead of rosehip oil. Jojoba is another very popular oil for nearly all skin types. And I know that not everyone loves lavender as much as me, so choose rose, bergamot, lemongrass, chamomile or another one of your favorite essential oils instead. If you like this recipe as much as me, it is easy to make an extra bottle or two to share with friends for the holidays. I bet they will love it too. This entry was posted in Health and tagged antiaging, argan oil, beauty, body care, bodyDYI, face oil, moisturizer, natural beauty, natural bodycare, rosehip oil. Bookmark the permalink. You are thoughtful and generous to share this information about essential oils. I am already enjoying using them.